Mortification of flesh is a tradition of showing devotion in Hinduism. Painful ways of doing penance shows the strength of devotion towards the almighty or the commitment towards a cause. With the power of faith, devotees overcome the pain of self-inflicted cuts and bruises on their body. The tradition of suffering pain is prevalent in many cultures across the globe. Deliberately inflicting pain makes devotion more challenging and poignant. We are taking a look at four Hindu festivals that has at least some element of self-inflicted pain. Thaipusam is an Indian festival celebrated by the Tamil Community in the Tamil month of Thai, which usually falls in January or February in the Gregorian Calendar. This festival is celebrated to commemorate the occasion when Parvati, consort of Shiva, gave her son Sri Murugan, a Vel (spear) to vanquish the demon Soorapdman. During the festival, devotees have their head shaved and carry a Kavadi (a semicircular decorated canopy) on their shoulders while dancing and singing devotional songs and make a pilgrimage to the temple along a set route. 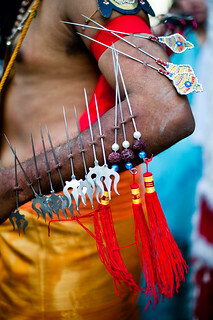 As a thanks giving for wishes fulfilled, devotees have small spears or spikes pierced through their bodies and skin mostly through their cheek or tongue. 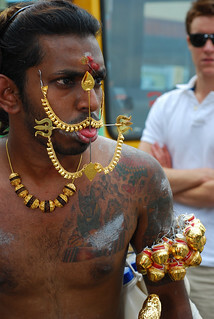 It is also a custom to have hooks (similar to fish hooks) pierced through their skin to tow heavy chariots. Devotees undergo purification rituals before undertaking body piercing so as not to feel the pain. Thimithi is a Hindu festival celebrated by Tamils, one week before Deepavali every year. 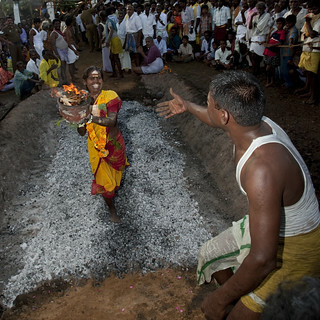 One of the rituals followed for the festival is Firewalking. The legend behind the festival comes from Mahabharata. It is believed that Draupadi, the wife of Pancha Pandavaas, ritualistically walked over the fire after the Pandavas came victorious in the war. For the ceremony, a fire pit will be dug, usually of atleast 3m length. The fire pit will be lit by the temple priest. 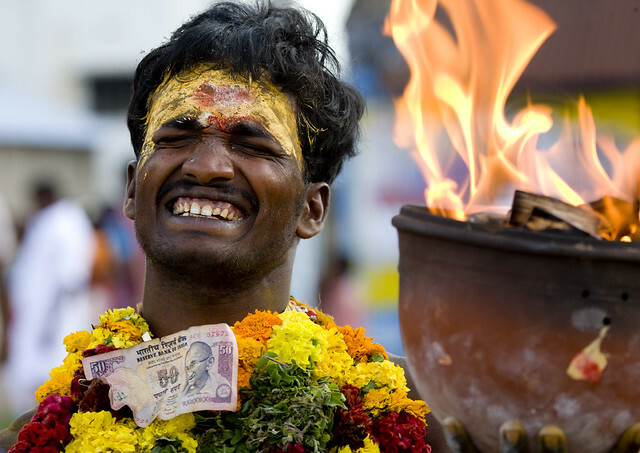 After ritualistic prayers, a yellow string with some turmeric and neem leaf is attached to the wrists of those taking part in the ceremony. The devotees walk through the fire and after completing the ritual, cool their feet with cow’s milk. The practise of fire walking is not exclusive to India. It is also performed in Greece, Tibet, Spain, China, Japan, Fiji Ceylon, Thailand, and many other parts of the world. It is often suggested that, the speed at which the participants cross the fire bed prevents them being burned. But that is not true. Most firewalkers don’t rush through the fire as suggested. Usually firewalkers go through a period of purification before the event, and their strength of mind and commitment to the cause along with extreme belief that God will protect them actually saves their day. There are incidents of people falling into the fire while walking and then sustaining serious burns to their body. 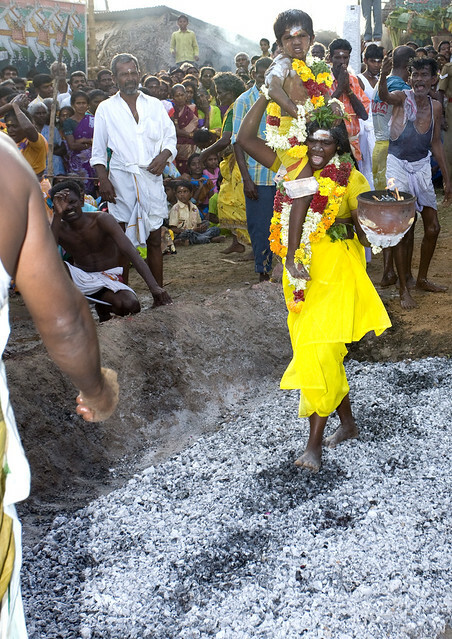 Karaga festival celebrated in Karnataka also culminates with the fire-walk. Karaga festival also has its roots from Mahabharata. The Attukal Bhagavathy Temple situated at Attukal in Trivandrum, Kerala is famous for the Pongala festival celebrated in which over three million women participate. Pongala festival also entered the Guinness book of World records for being the largest congregation of women for a festival in the world. 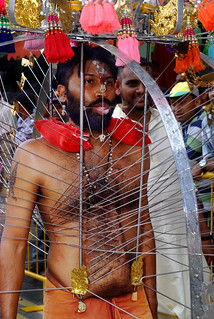 This Pongala festival also has another ritual called Kuthiyottam, in which young boys are paraded with pierced metal wire (silver hooks) on the side of their abdomen. The boys are also made to live in the temple for five days continuously cut off from their home and parents. The boys have to perform rigorous religious tasks, like getting up early at 4 ‘o’clock, taking a dip in the temple pond thrice daily performing 1008 prostrations and sleep bare on temple ground. On the fifth day, the flesh is pierced with a metal hook and cane threads are inserted into it. Then they are taken out in procession wearing yellow clothes and garlands. This ritual began as an alternative for human sacrificing. The popular myth behind the ritual is as follows. A King prayed Goddess Bhadrakali to grant perpetual prosperity for his subjects. The boon was granted but Bhadrakali asked the King to sacrifice a healthy educated boy at the age of 10 every year in return. As years passed, human sacrifice gave way to symbolically inserting a cane thread on the body of a ten-year-old. Every year hundreds of children participate in this ritual. Now a days, rich people hire kids from poor families by offering money to their parents and then offer them to the temple for Kuthiyottam. Garudan Thookkam is a ritual performed in some of the Kerala Temples during the festival of Meena Bharani and Pathamudayam. It is also an offering to Goddess Kali for wishes fulfilled. The legend behind it is from Hindu Puranas. After killing demon Darika, Goddess Kali did not come back to her old self and she remained insatiable and thirsty for blood. Lord Vishnu sent Garuda to quench her thirst. Only after getting blood drops from Garuda, Kali was pacified. 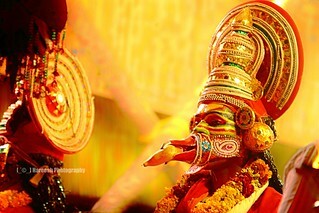 During the Meena Bharani festival people dress up as Garuda and perform dances inside the temple. After the performance they dangle from a shaft with hooks pierced on their backs. Garudan Thookkam at Elamkavu devi temple at Vaikam in Kottayam district is a well-attended celebration. After a night long performance at the temple, these Garudans, will be hung on a tall pedestal like structure and will be taken around the temple by devotees. Depending on the temple, there will be differences in the way the ritual is conducted. The temples famous for Garuden Thookkam are Pallikkalkavu Bhagavathi temple at Njeezhoor in Kottayam, Kottekkavu Bhagavathy temple in Ernakulam, Araynkavu devi temple in Ernakulam and Irapuram devi temple Near permbavur .